Where else can you go 4WDing only one hour from home and have a view like this? Sunday 28 September, 2014 continued the brilliant Spring weather in the south. Trip Leader Kate in her Landcruiser met Colin in his trusty Safari and Glenys & Neil in their Land Cruiser at the Crown Range car park, and later at Bannockburn Pub we hooked up with Pam in her Surf, then headed off and upward toward Duffers Saddle. Shortly before reaching the saddle Pam’s truck got all hot and bothered squirting steaming water in all directions. We diagnosed the problem as a radiator core quite heavily blocked up with vegetation and Pam elected to leave the Surf there to cool down and climbed in with Kate. 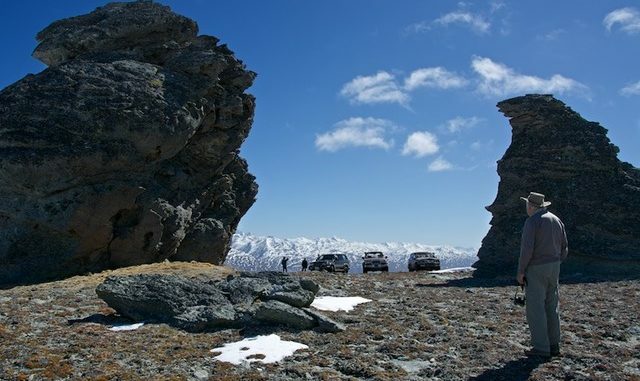 The track south from Duffers Saddle was wet and slippery, almost like driving on ice, so we all took extra care to stay on the track and in the wheel ruts to prevent any chance of sliding off down a gully. At the Old Woman Hut we met four adults, two children and two excited dogs who had stayed the night and had a roaring fire going preparing lunch. They had ferried all these folk, children, dogs and gear from several kilometres back, where they had abandoned their Subaru car, in a small Suzuki 4WD. After lunch and several photos we headed further south climbing high onto the Old Woman Range eventually and inevitably getting into the snow where the fun started. Intrepid photographer Colin ran way ahead up the track and signalled Kate to go for it. Unfortunately Colin was straddling the wheel tracks that prevented Kate from changing direction and at the very last minute he had to do an Israel Dagg imitation diving try with the Nikon clutched way out in front in place of the ball. Kate just missed running over his ankle. Back at Duffers Saddle we topped Pam’s Surf up with water and headed home stopping in at Jones’ orchard for a fruity ice cream. A trip of brilliant sunshine and super scenery. Trip report by Neil McGill.